Lowest interest rate credit card available for existing Bank of Ireland customers. Apply for your Platinum Advantage Mastercard online in minutes or call us on 0818 200 412 - Monday to Friday, 8am - 8pm. No transaction fees: Pay no transaction fees when you use your credit card to pay for goods and services. Cross border handling fees apply to non-Euro transactions. Interest free credit: Pay your bill in full and on time every month and don’t pay any interest on purchases. Enjoy up to 56 days interest free credit on what you buy. Interest is charged on cash advances and outstanding balances. 24 Hour approval:3 and get your card within 1 week. Lowest interest rate card: Our lowest interest rate credit card. Free Travel Insurance: Comprehensive multi-trip travel insurance including winter sports when at least 50% of the total holiday costs of your insured journey are paid using your card. Low cost instalment option: Spread the cost of larger purchases at a great low rate by taking advantage of our unique credit card Instalment Plan. Click here for more information. Free Additional Cardholders: Add up to 3 additional cardholders and still pay government stamp duty only once. Click here to apply now or download the form here. Well protected: Chargeback Rights: You are protected when you use your credit card to make purchases in the event of loss or non-receipt of goods / services and in the event of fraudulent activity. Emergency Cash Service: Should you lose your card while abroad, we’ll cancel your card. If you are abroad we can provide you with an Emergency Cash Advance Facility in most countries (Subject to available credit, fees and charges may apply). Paying with Contactless: Contactless is a fast, easy and secure way to pay for items. It’s ideal for quick stops at coffee shops, grocery stores and pharmacies at home and abroad. There is no need to put your card into the terminal or enter your PIN, all you have to do is simply hold your credit card against the card reader. When you use contactless, a unique code is generated for your payment –so your actual card details are never shared with the retailer. 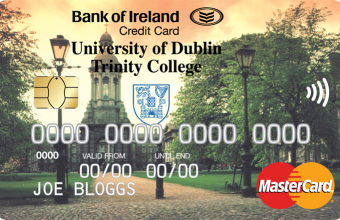 Exclusive offers and experiences: As a Bank of Ireland MasterCard customer, you will get access to exclusive experiences, offers and benefits in Ireland or when exploring other destinations abroad with MasterCard Priceless Cities at www.priceless.com. It only takes a couple of minutes to complete the online application. 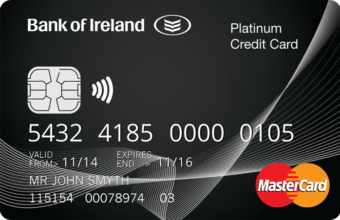 1 0% interest on purchases available for new credit card customers for the first 6 months. After 6 months from the date of account opening standard interest will apply to purchases the details of which are outlined in the rates section. 2 Available for new credit card customers for the first 7 months from the account opening. At the end of the introductory period the annual interest rates will revert to the standard rate applicable to your card at that time. 3 24 hour approval means next working day provided that we are in receipt of all relevant information and documentation. Applications for non Bank of Ireland customers and applications referred to underwriting may take longer.